Beerkada Comics » Beerkada Buckets spotted at Oyster Boy, Shopwise Cubao! Beerkada Buckets spotted at Oyster Boy, Shopwise Cubao! 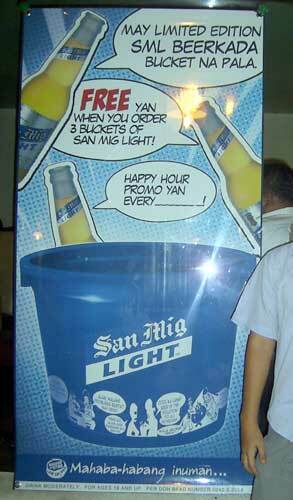 The SanMigLight people promised that the promotional Beerkada Buckets would be available this April. Well, Carpool creator Syeri B. sighted the elusive bucket at Oyster Boy in beautiful Shopwise, Cubao. Now we wait a little longer for the buckets in convenience stores. Keep a lookout, guys! I also need 5 other volunteers to drink 3 SanMigLight apiece at Oyster Boy. We’ll have a lottery to see who gets the coveted Beerkada bucket. 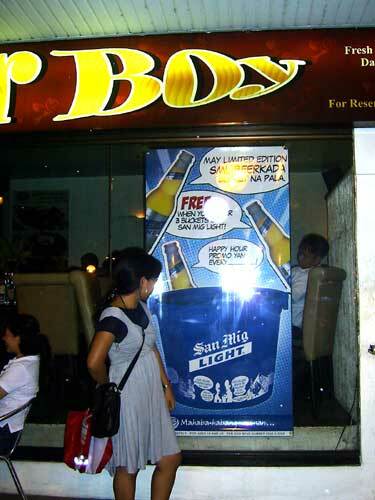 If you also have sightings of the Beerkada bucket aside from the one in Oyster Boy Cubao, please do let us know. Why do I have gut feeling the launch for the next book would be there? saw a bucket in seafood island eastwood! Leo: I doubt it. The fans are crazed enough without alchohol in their system. Lyndon has to worry about crowd control…as always. Congrats by the way, L. Er, is there any way I can join the lottery without actually having any beer? I want a bucket! Mary: Bring a designated drinker with you. Hey L & Chompy, sa metro manila lang ba ang promo or is it nationwide? Nagpapainggit naman kayo… Wala bang Red Horse Beerkada Bucket? Ken: there’s Red Horse Beer in Thailand? Puwede bang after the swimming outing para nightcap na rin ng Beerkadets? Yep, but unfortunately, Iba ang lasa… Sikat na rin dito ang SMB. We were pigging out earlier in an all-you-can-eat shabu-shabu buffet and I noticed that there are a lot of SMB draft tower served around the place, surprisingly, the live-band played the Thai version of Anak. Incidentally, Freddie has a niece here who is a Thai National by the name, Christina Aguilar. Ken: the whole world has a pinoy connection. When I visited the states years ago, there was not one day that I didn’t meet at least one pinoy, and most americans I’ve encountered over there have friends or are related to pinoys. the Clinton white house had no less than 10 pinoys on the household staff alone and right now a pinay runs the white house kitchen. we may not have weapons of mass destruction or be a monetary world power, but we are a dormant superpower nonetheless, our main resource being manpower. Expats, OFWs, spouses and even the call center employees here in the country. If all of them go on strike at the same time, the rest of the pampered world will crumble. yeba: Which bucket? Is it the previous design of SMB Light, or do they have the new Beerkada designs? Tenk: Yey. kaso pag after swimming, we have to go to the bar.. I’m not sure what they’re policies are if we order out the beer and buckets. Chompy: I’ll keep an eye out and let you know. So far I haven’t seen the tarps like the pics you posted over here. i wanna join the drinking spree… pero i want a bucket as well… pano yun? Rehaz: It’s like this. The whole group would have to order at least 18 bottles of San Mig Light (that’s 3 buckets). Each one would drink and pay for 3 bottles each. Afterwards, there would be a raffle among the participants as to which one would get the bucket, because only one bucket is given away for a consumption of 3 buckets worth of beer. 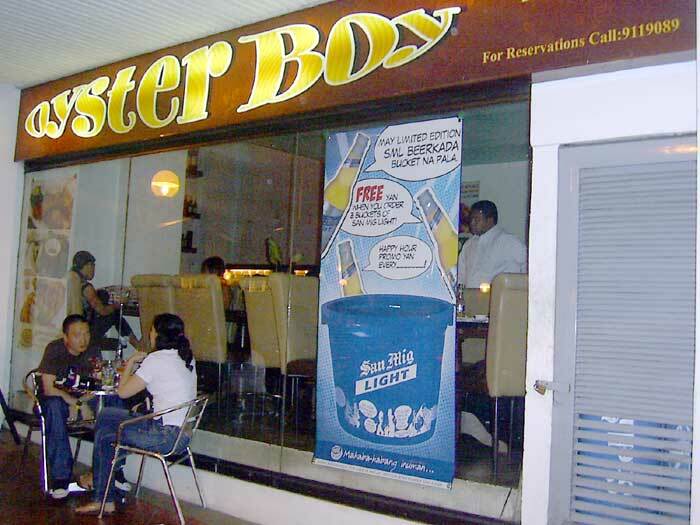 Venue would be Oyster Boy in Cubao, unless a better location/bar that offers the bucket comes up. Tenk: We just need to finalize on the swimming venue. :p any recommendations? ooohhh… it just got interesting… kelan mangyayari yan? Gusto ko sana sumama kaso ang layo ng uuwian. Hindi ako puwede pag gabi ng Thurs/Fri dahil hanggang 10-12 shift ko. definitely a beerkada bucket. we don’t usually pay attention to the bucket they serve us but that one caught my eye. i’d take a pic next time we go there!